We’ve blogged about ‘Text Neck’ before, but worryingly we are seeing more and more cases of this increasing phenomenon. Text Neck is the term used to describe neck pain and damage obtained from looking down at your mobile phone, tablet, and other wireless devices too often and for too long. Did you know that 53%* off mobile phone users suffer from some form of neck pain, and this figure is increasing all the time. Text Neck is becoming increasingly common. It is the repeated stress and injury to the body caused by excessive texting and overuse of handheld electronic devices. 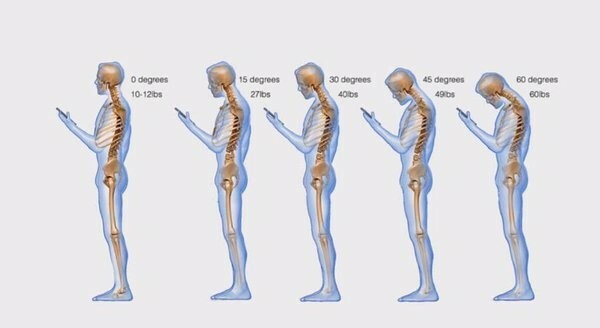 The term Text Neck is derived from the onset of cervical spinal degeneration resulting from the repeated stress of frequent forward head flexion while looking down at the screens of mobile devices and ‘texting’ for long periods of time. Children and teens are especially at risk for suffering symptoms of text neck. Neck muscles are often already strained from time spent on the computer and the usual wear and tear of the day, but continuous mobile phone and tablet use can causes an additional build up of pressure in the neck muscles. This can eventually pull your spine out of alignment, which will lead to more pain and more strain on your neck and back. Among the most common complaints associated with Text Neck are pain felt in the neck, shoulder, back, arm, fingers, hands, wrists and elbows, as well as headaches and numbness and tingling of the upper extremities. So how can you treat Text Neck? Well, obviously prevention is better than cure. Limiting the amount of time spent on your mobile phone, tablet or other wireless device will reduce the symptoms and help prevent future problems with your neck and back. If you still need to use your phone for long periods, try holding it up at eye level. This is the same for all screens in fact – see our post on ‘Improving your workstation’. The main aim is to avoid looking down with your head forward for long period of time as you will be putting excessive strain on your neck. Take a moment throughout the day to check your posture and straighten up! To support your upper body including your neck, you need to have string core muscles. This includes your stomach / abdominal muscles and your lower back muscles. Tuck your chin down into your neck, then slowly raise it up toward the ceiling. Rotate your head so you are looking over one shoulder, then turn slowly and rotate in the other direction. Rotate the shoulders in a clockwise direction while holding the arms down by the sides of the body; repeat in a counter clockwise direction. If you are experiencing an increase in pain and strain on your neck and back, have a think about how often you use your phone or tablet, it might just be the cause! Of course we are here to help too if you think you need adjusting. To book an appointment at either of our Clinics in Torbay or Teignmouth, call us on 01803 329799 (Torbay) or 01626 774222 (Teignmouth) and we’ll let you know how we can help. *Always Connected: How Smartphones And Social Keep Us Engaged. ← What is the difference between a chiropractor and a physiotherapist?